BEAU cream cleanser is a powerful deep cleaning cream for use on all surfaces not harmed by water. It quickly and easily removes soil, stubborn stains, grease, soap scum, heel scuff marks from a variety of surfaces leaving them smooth and clean with a lustrous new look. Contains no harsh alkalies or acids. Posseses a very pleasant, fresh odour. Will not clog drains or pipes. 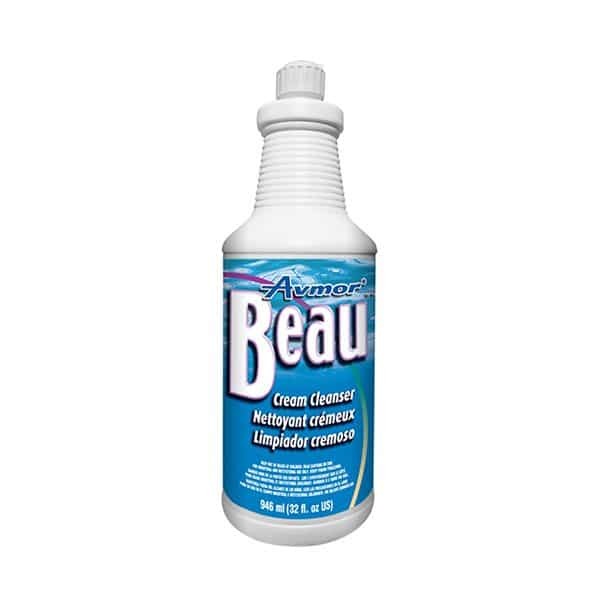 BEAU cream cleanser clings to both vertical and horizontal surfaces providing longer contact to ensure superior cleaning and more effective stain removal. It is ideal for cleaning, brightening, and polishing the following: sinks, wash basins, bathtubs, shower stalls, chrome, copper, brass, stainless steel, porcelain, enamel, vitreous ware, ceramic tiles, swimming pools, pots and pans and many other hard surfaces. 1.Squeeze onto damp sponge or cloth and apply to soiled area. May also be squeezed directly onto surface to be cleaned. 2.Agitate to loosen soil. Rinse with water or remove with damp sponge or cloth. 3.Polish surface with a clean dry cloth.